Have you ever heard of Jeffrey M. Leib? Neither had I until I came across this interview, but people in W. Bloomfield, Michigan know and respect him. Mr. Leib is an attorney and among his many accomplishments, he was also the first president and a founding member of the Optimist Club of W. Bloomfield, Michigan in 1971. This post, however, is not about Mr. Leib. 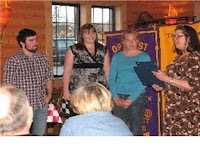 It is about what it takes to get your Optimist Club recognized in your community. Our Optimist Clubs perform fabulous projects, but only sometimes do our newspapers take notice. One sure way to get your Optimist Club noticed is to garner the endorsement of a prominent citizen. That endorsement means even more when they speak about our cause - Optimist Clubs - with passion. Take the Jeffrey M. Leib interview for example. With 1.5 pages devoted to the purposes and projects of Optimist Clubs and the positive impact they have on youth, it is easy to see how an Optimist Club makes a difference. Add in the story of Mr. Leib's active community involvement and you can see how Optimist Clubs have always been a priority in his life. If I were a reader, I would want to be involved with such a cause. How about you? Calling all junior golfers! The Meridian Optimist Club is sponsoring the first ever Meridian, Idaho Optimist Junior Golf Tournament on June 9, 2009. The event is a pre-qualifying tournament for the Pacific Northwest District Optimist International Junior Golf Tournament. According to coordinator Bob Thompson, the Meridian Optimist Club hopes to encourage more Idaho players to participate in the tournament series. "We want them to have an opportunity to play close to home, gain a little tournament experience, and possibly win a sponsorship to the district tournament," he explained. First place finishers in age divisions Boys 14 - 15 and 16-18 and Girls 14 -15 and 16-18 will receive an expense-paid trip to Hillsboro, Oregon for the PNW District Tournament on June . Golfers who qualify at the District level event will advance to the Optimist International Junior Golf Tournament at the PGA National Resort & Spa, July 23 - August 2, 2009. Download a registration form for the Meridian Optimist Club Junior Golf Tournament. Find out more about the Optimist International Junior Golf Tournament. We thought they were fabulous when we attended the 2008 PNW Optimist District Convention in Chilliwack. Who were they? All of the wonderful, youthful performers arranged by the Chilliwack Optimist Club. There was a ragtime band with some blues and soul added in to keep us dancing. There were classical musicians and vocalists who shined. We were told it was because of the local high school music director and the community's emphasis on arts, but I think the Optimist Clubs' involvement has a lot to do with it. Over the past month, the Optimist Clubs of Mission, Chilliwack and Burnaby have sponsored talent contests for the kids. Here are two articles about the contests. I hope to have more to report on the events soon. Please send your pictures, press releases or links to videos to linda at newoptimistclub dot com. Many Optimist Clubs hold them, and all will agree these fun events are the fastest projects your Optimist Club will ever do. What are they? Easter Egg Hunts of course! Official time: 1 minute 43 seconds. That's how long it took for the little hunters and gatherers to make their way to the finish line with their candy at the Meridian Optimist Club Easter Egg-Off. Caseloads of candy were spread out in four age groups and hundreds of youngsters up to ten years old raced through the course collecting their treasure. Many also garnered specially marked prizes and got to choose from tables full of gifts donated by Meridian, Idaho businesses. The Meridian Fire and Police Departments joined in the fun. You can watch the slide show and enjoy it too! The Power of Youth - 1st Place by Kristen Bergey "Travel, Work Shape Outlook"
The Power of Youth - 2nd Place by Taylor Trout "Ability to Work is the Power of Youth"
The Optimist International Essay Contest began in 1983 as a way for students to express themselves around a central theme or topic. In addition to developing their writing skills, students have the opportunity to win college scholarships ranging from $650 to $6,000. All contests must begin at the club level. There are more than 3,000 Optimist Clubs around the world. You can find the club nearest you by clicking on the Optimist Club directory or visiting www.optimist.org. Share these thoughts with others. 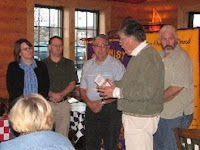 Apply the purposes to the projects that your Optimist Club sponsor and perform. Embody the spirit and action of Optimist Clubs around the world and I am certain your club will grow and succeed. The Optimist Oratorical Contest is by far my favorite Optimist International program because it emphasizes the importance of communication. The participants learn to gather their thoughts, write them down and then present them in a manner that is engaging and informative. All the while Optimist members, parents, and other community members get the opportunity to hear what kids think and discover how they process their thoughts. We also get to marvel at their ability to stand in front of a crowd of strangers and improve every time they deliver their message. And some come back every year, improving and impressing us every time. 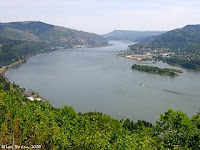 In Vancouver, Washington there is a family of public speakers, the Jones'. Last year we met Clareesa Jones as she took first place at the District Optimist Oratorical Contest. This year, three more Jones girls participated in the Vancouver, WA Optimist Club Contest. Shown left to right are Larry Smith (judge), Sonia Jones (1st Place), Ariel Jones (2nd Place), Lynn Helsel (judge), Merci Jones (4th Place), Claudia Dalton (judge), and Max Hsaio (3rd place). The Zone contest will be held on April 11 at 10 am. Watch streaming video of the Optimist Oratorical Contest here. 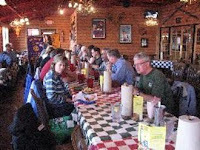 Does your Optimist Club offer social meetings as well as business meetings? Of course every meeting should offer a good mix: ample opportunity to network with your friends and colleagues, the opportunity to learn something from a guest speaker about initiatives and other organizations in your community, and an appropriate amount of club business. Some clubs have found that they enjoy a more social setting on occasion. One of those clubs is the Boise Noon Optimist Club. Whenever a month has a fifth Tuesday (their regular meeting day) they meet at night for a social gathering instead of a regular noon-hour business meeting. According to club leaders, this allows spouses and other people who don't or can't attend at noon the opportunity to come and enjoy Optimist fellowship and get caught up on what their Optimist Club is doing. It also gives the club a change of scenery. Sometimes that is all that is needed to spark new interests. This week was one of those Tuesdays. Bulletin editor Wes Callahan sent us a few pictures of the Boise Noon Optimist Club enjoying themselves at Fuddruckers. From top to bottom: some of the Boise Noon Optimist Club members, Essay Contest winners are congratulated by President Cindi Wall, and sponsors welcome New Member Dawn Bassett and Ken Hauntz.